Do you like money? Do you like watching numbers go up? Do you like clicking things, over and over again? Then you’ll love Vostok Inc., the game of galactic capitalism. 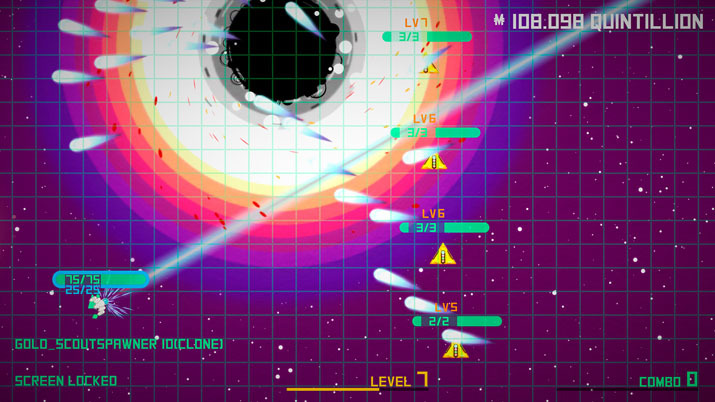 Vostok Inc. is an incremental game in the vein of the horribly addictive browser games that took over our lives a couple of years back. The concept is simple: You purchase production buildings which produce a certain number of dollars each second, and you use those dollars to purchase more production buildings, until you get bored or you finally reach infinity dollars. 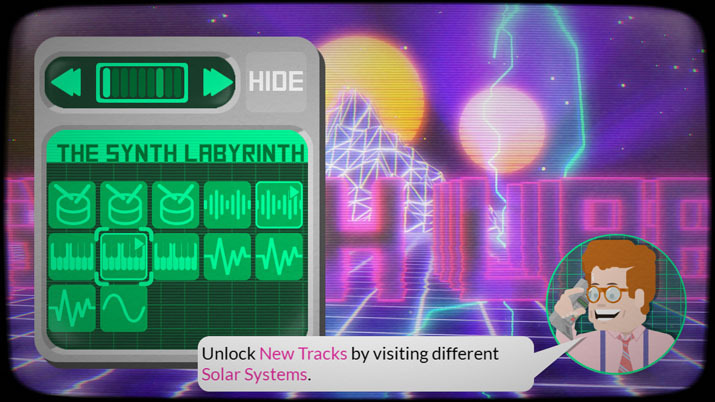 In the spirit of browser-based incremental games, Vostok Inc. involves a macabre sense of humor about capitalism. There are also a few bells and whistles added to the core concept: you can purchase upgrades for all of your buildings, and there is a combat element reminiscent of arcade space shooters. You pilot a spacecraft – with upgradable weapons, of course – and travel around the galaxy, bringing capitalism to every planet that crosses your path. This adds an extra layer to the incremental concept, since each planet is one incremental game in itself, and multiplying this by several planets means you can really start raking in the dough after a while (but of course, there’s never enough). You can also pick up executives and middle managers who have somehow gotten lost in space, and these will add modifiers to your income. A curious mechanic is added by the fact that executives provide better bonuses when they’re happy. In order to satisfy them, you can give them gifts on a Tamagotchi style interface. These little devices also have various, basic mini-games, but they seem to be just for fun, as they have no impact on the game itself. You start your corporation from the Solar System, of course, one mine at a time. You quickly find out that there is an organized crime ring already in place, however. These extra-terrestrials fight you every step of the way as you expand from planet to planet. Things get even more interesting when you manage to beat the boss and travel to another star system, and you depart from the planets you know and love, launching on a journey amongst the stars. In each system, there is a different theme and another race of aliens fighting your progress. These are surprisingly varied in their characteristics and motivations, so their interactions with you are often funny and unique. The aesthetic of each system provides something new to look at, and the musical score follows suit. My favorite is a cutesy system where the sun is a smiling face and the asteroids are clouds with rainbows. The aliens are led by a cute-yet-creepy raccoon, and the music is upbeat to a ridiculous degree. Still, it’s just a clicker game in the end. Somewhere in the trillions or quadrillions of dollars range, you inevitably start to feel that everything is a bit same-y, despite valiant attempts to make it otherwise. Your fingers start to hurt from clicking, and the task of upgrading all your planets starts to become Sisyphean. This isn’t helped by the ship upgrades; many of the upgrades, especially in the beginning of the game, seem pretty pointless -- why do I need to know how far away the sun is? The mini-games also seem like something they threw in to spice it up; to justify spending money on what could have probably been a browser game. Your personal assistant also starts to get annoying. In the beginning, he provides you with a helpful tutorial, but once you’ve mastered the basics he just chimes in once in a while with something like, “Stock update: Jalapeño farmers are a spicy pick.” Wakka wakka! You could go insane reading all his finance-based puns over and over. The combat is never really challenging or varied enough to justify itself, either. Sure, there are a variety of enemy types and tactics, but, after a while, they start to seem like the same ol’ soup. There are some surprises in this title here and there which I won’t spoil (LASER UNICORN SQUADS!? ), but overall, you can only watch numbers go up for so long. Vostok Inc. is as addictive as any other incremental game – in fact, it’s one of the better incremental games to come out; it has a lot more polish and character, along with humor, great artwork, and music. It’s nigh impossible to stop playing (because, what happens when you reach the last number there is? ), but once you do, you wonder what the point of it all was.